build manages the overall translation of individual components and creates a set of .html and .js files that can be served up by a Web server. Browser history management, covering "Back", "Forward" with no hassle for the developer. AJAX applications typically break the "Go Back" button: use the History module to provide your application with History management. 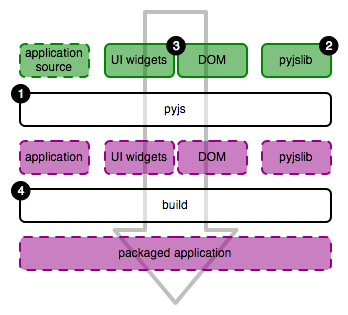 pyjs handles all cross-browser issues for the developer. pyjs is entirely Free Software. Execute pyjd hello.py, or python hello.py, to run the very same application native on Python, giving you a Python stack trace on errors. pyjs Desktop gives you much more control making testing and debugging a piece of a cake. Note the hello.html file referenced above: this is a container for your application generated by pyjs that you can adjust to your needs. Ready for more? Let's get started!